Sarayaku is an indigenous Kichwa community from a remote part of Ecuador’s southern Amazon. A delegation has travelled to the capital city of Quito to present a bold and visionary proposal that aims not only to protect their own 135,000 hectares of pristine rainforest, but to protect indigenous territories worldwide. The proposal, the Kawsak Sacha Declaration, also seeks to promote the indigenous worldview, which sees nature as a living entity, to be respected and coexisted with. The Sarayaku believe that a shift towards this perspective could be the key to mitigating the unfolding global environmental crisis. The concept for the proposal came from the kawsak sacha, or living forest, itself and was transmitted to the community via their shamans (yachaks in the Kichwa language), who act as intermediaries between the rainforest and those who protect it. The Kawsak Sacha Living Forest Declaration (LFD) is a counterproposal to the prevailing extractivist model that has already wrought untold damage in Ecuador’s northern Amazon and around the world. Instead of seeing Sarayaku territory as an inert space to exploit for resources, the Declaration describes the rainforest as a living entity with consciousness, constituted by all the beings within it, including those from the animal, vegetable, mineral, spiritual and cosmic worlds. The Declaration asserts that the territory is subject to legal rights and demands that these rights be upheld. It also declares that the area be free of any type of extractive activity such as oil exploitation, mining, logging and biopiracy. Though it was born from the indigenous cosmovision, the Declaration is a concrete proposal based on existing national and international law. In 2008, Ecuador became the first country to award legal rights to nature in its constitution, which also states that any person, community or nationality can demand the State to uphold these rights. Furthermore, the UN Declaration on the Rights of Indigenous Peoples states that indigenous peoples have the right to maintain and strengthen their spiritual relationship with their territories, and to conserve and protect these territories. From deep in the Ecuadorian Amazon, the Kawsak Sacha Declaration was borne by canoe to Quito, where the Sarayaku delegation delivered it to representatives of the Ecuadorian State at a launch event on July 26. The next step is to demand the legal ratification of the document via the National Assembly or the Constitutional Court. If the State refuses to recognise the Declaration, it will be defying its own constitution and international law. The Sarayaku have called for international organisations and indigenous peoples to adopt the proposal and are planning to present it to the UN. It won’t be the first time the Declaration has been given a global audience. After being adopted by the Assembly General of the Original People of Sarayaku in 2012, it was presented in Paris at the global climate change conference, COP21, and to the President of France, François Hollande, in 2015. Earlier this month, it was well received at the international Fostering Community Conservation Conferencein Montreal. The Declaration was inaugurated in Ecuador with a four-day exhibition and conference from 25 to 29 July that showcased Sarayaku’s way of life, culture, and vision, including exhibitions and demonstrations of ancestral medicines, ceramics, handicrafts, gastronomy, face painting, singing and dancing. A Kichwa house was built in El Arbolito Park and will remain there, a gift to the city of Quito. A series of panels were held to discuss extractivism and defence of the rainforest. The events were attended by international NGOs Amazon Watch, the International Union for Conservation of Nature (IUCN) and the Women’s Earth & Climate Action Network (WECAN), as well as the Presidents of national indigenous organisations CONAIE and CONFENAIE. The launch of the Declaration coincided with the 6th anniversary of the historic ruling of the Inter-American Court of Human Rights, which found that the Ecuadorian Government violated the rights of the Sarayaku people by allowing an oil company to prospect in their territory without consultation. In 1996 the Argentinian oil company CGC, accompanied by soldiers, carried out detonations, felled trees, dug more than 400 wells and buried more than 1.4 tons of high grade explosives in Sarayaku territory. The community was unaware that their land had been concessioned to an oil company until armed men arrived in helicopters. In 2018, Sarayaku is once again threatened by oil exploitation. The Ecuadorian Government are planning to auction 3 million hectares of largely virgin rainforest in the XI Oil Round, or Ronda Sur. Three of the oil blocks cover nearly all the Sarayaku territory, the borders of which are being planted with flowering trees to symbolise the community’s peaceful resistance and defence of their territory via the Kawsak Sacha Declaration. 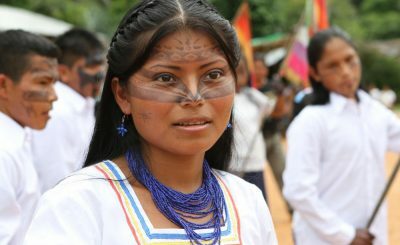 The Sarayaku people’s hopes for the Declaration go beyond the protection of the 135,000 hectares that lie within their borders. The proposal was presented to the State on behalf of all indigenous peoples with the hopes that other nationalities will use it to uphold the legal rights of nature in their territories. With indigenous peoples acting as stewards of 95 percent of the planet’s most threatened biodiverse regions and key players in the fight against climate change, the Declaration could have a global impact. It’s a bold vision for a village of 1400 people living deep in the Amazon, but, looking at their past achievements, it’s impossible not to take the Sarayaku proposal seriously. Beyond their legal victory against the Ecuadorian State, this is a community that has launched a professional football team; sailed a canoe down the Seine; and created a documentary, Children of the Jaguar, which won Best Documentary at the National Geographic Film Festival. The Sarayaku call themselves the People of the Zenith, referring to an ancient prophecy of their ancestors claiming that they would be a pillar of resistance after other communities had surrendered, a beacon of light as strong as the sun at noon. “The Sarayaku resistance is based upon our deep connection with the rainforest, which even our young people still maintain, and our unity. “The Sarayaku community functions as a single organism, like a human body. We resist in fulfilment of the ancient prophecy of our ancestors. We have seen what has happened to our brothers in the northern Amazon region, who have not only experienced the destruction of their territories by oil exploitation, but have suffered a spiritual impoverishment. Bethany Pitts has been working with indigenous communities in Ecuador since 2013, especially those defending their territories from extractivism. She is currently writing the Moon Guide to Ecuador & The Galapagos Islands (2019), which will be the first international guide book on Ecuador with a focus on eco- and community tourism.